The primary concern of this study is to present, elucidate and analyse the developments which have characterized the sociology of knowledge, and which have set for it the outlines of its major problematics. 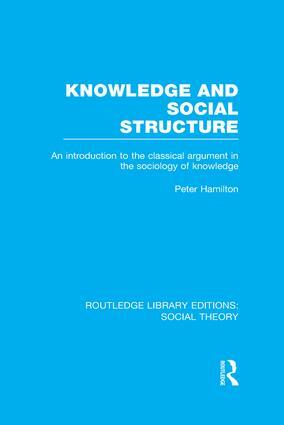 Peter Hamilton examines the most distinctive approaches to the determinate relationship between knowledge and social structure. He considers the three main ‘pre-paradigms’ of the sociology of knowledge based on the work of Marx, Durkheim and Weber, and looks at the contribution of Scheler, Mannheim and phenomenological studies to this complex field. He explores the intellectual context, particularly that of Enlightenment philosophy, in which the problems involved in producing a sociology of knowledge first came to light. In conclusion, the author suggests an inclusive perspective for approaching the difficulties posed in any attempt to describe and explain relations between knowledge and social structure.